Around the world, cities are choking on smog. But a new AI system plans to analyze just how bad the situation is by aggregating data from smartphone pictures captured far and wide across cities. The project, called AirTick, has been developed by researchers from Nanyang Technological University in Singapore, reports New Scientist. The reasoning is pretty simple: Deploying air sensors isn’t cheap and takes a long time, so why not make use of the sensors that everyone has in their pocket? The result is an app which allows people to report smog levels by uploading an image tagged with time and location. Then, a machine learning algorithm chews through the data and compares it against official air-quality measurements where it can. Over time, the team hopes the software will slowly be able to predict air quality from smartphone images alone. There’s room for error, of course: Poor images or strange exposures could confuse it. But results taken in aggregate should allow the system to avoid mistakes due to such causes. The idea, after all, isn’t to report smog levels from a single photo, just to provide insight into pollution levels more locally than can be achieved right now. 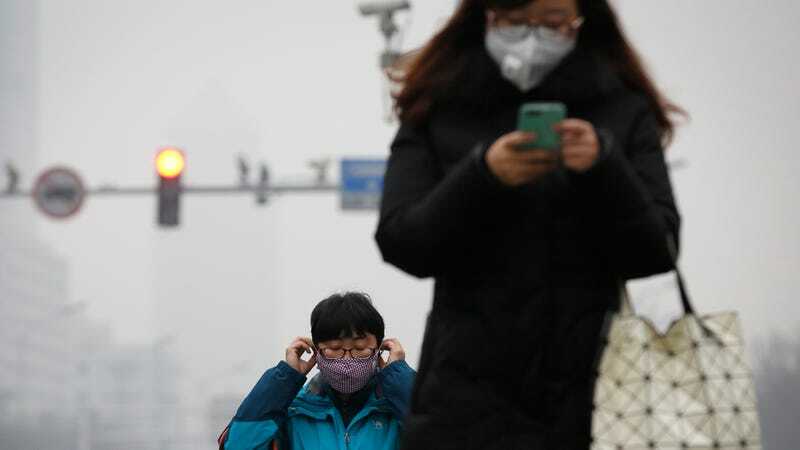 The results could be used to warn people when smog levels are too high for, say, asthmatic children to venture to the park, or to allow people to schedule their exercise so they’re not running during peak smog. The project will be presented at the AAAI Conference on Artificial Intelligence in Phoenix, Arizona, later this month.